I am finally writing a post somewhat in a timely manner. But, you will still be reading this late although in order at least (it won’t be scheduled to post for a few days.) I’m backed up with all the posts from Mesa Verde. The connection was just so bad there that I never uploaded our photos and hiking tallies until yesterday. Today is Saturday and we are leaving Blanding, UT for Torrey, UT. 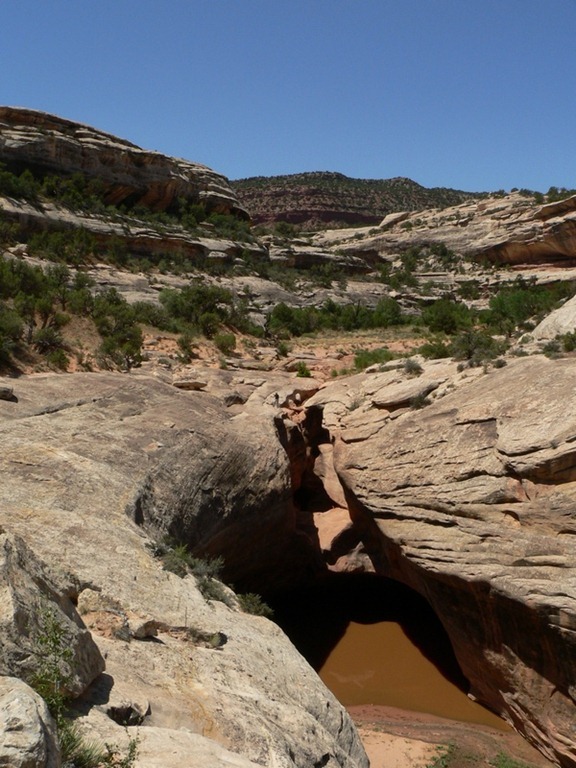 Blanding is a nice small town that is close (and I use this term loosely – close as in in the closest civilization) to Natural Bridges National Monument. Besides taking a day for the drive to Natural Bridges, we also visited the Edge of the Cedars State Park. The State Park has a small ruin with a roofed Kiva you can enter but the highlight is really the lovely museum. Mesa Verde National Park needs a museum of this quality. 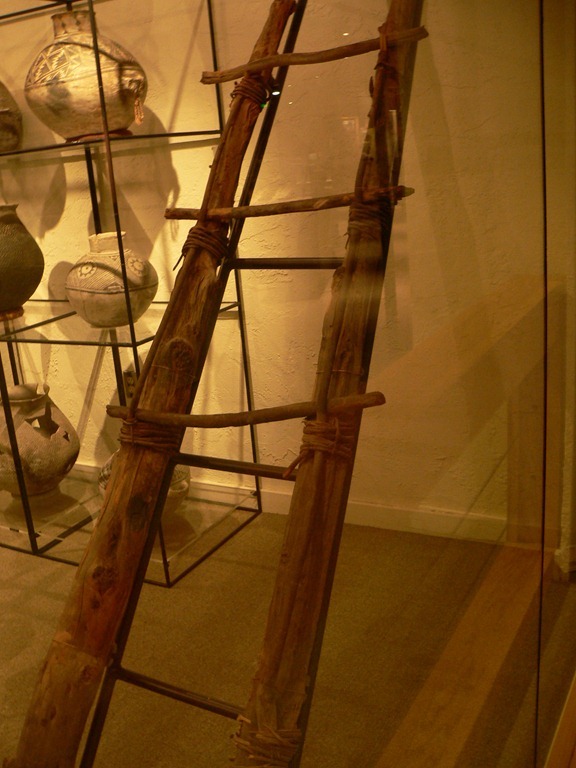 This isn’t a great picture but I really enjoyed seeing an actual Ancestral Puebloan ladder and how it was constructed. You can just see some of the pottery in the background. The museum had their pottery displayed in such a way that you could see the quality and construction techniques evolve over time. 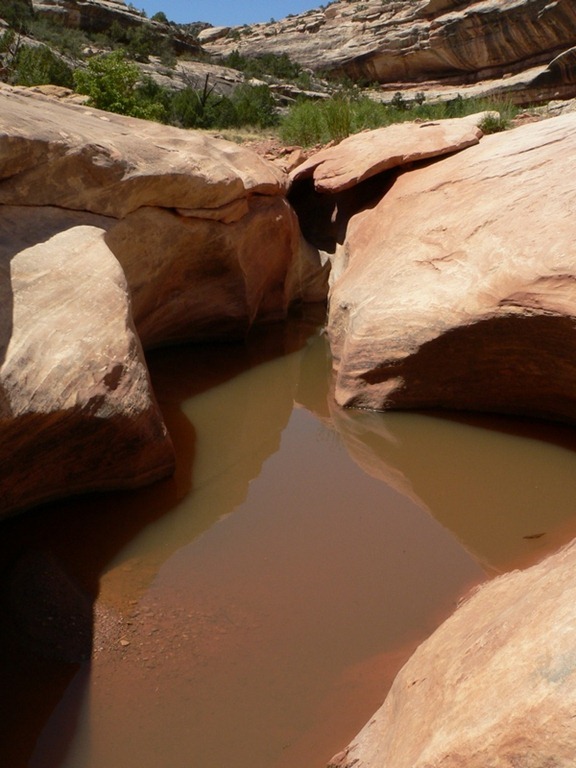 We thought we might make the drive out to see Goosenecks State Park where there are views of the gooseneck curves in the Colorado river. Since there wasn’t any hiking (or really any thing other than an overlook and a pit toilet,) we decided to pass on the hour drive each way and do laundry instead! 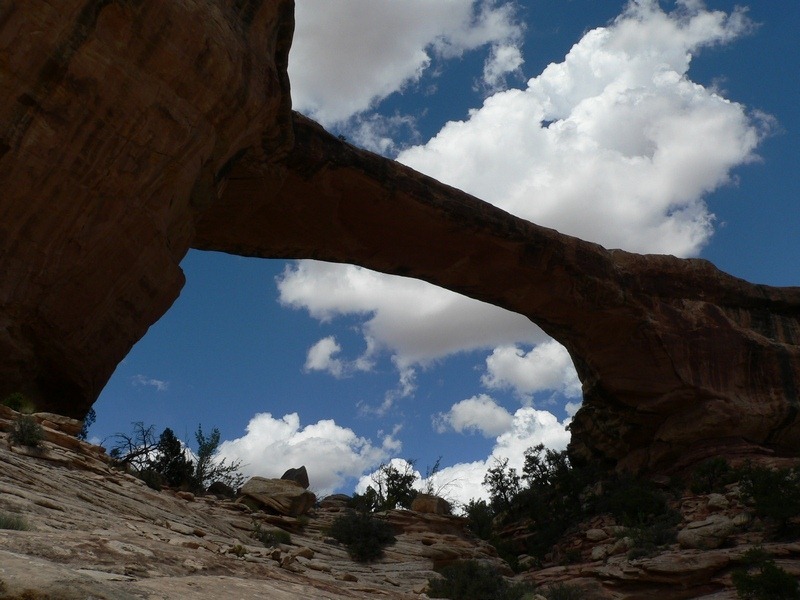 Is an Arch a Natural Bridge? Is a Natural Bridge an Arch? Answer at the bottom . . .
We hiked to entire trail which was kind of interesting because they don’t maintain the trail along the canyon bottom. You kind of follow the wash in some areas and had to occasional bush whacking. 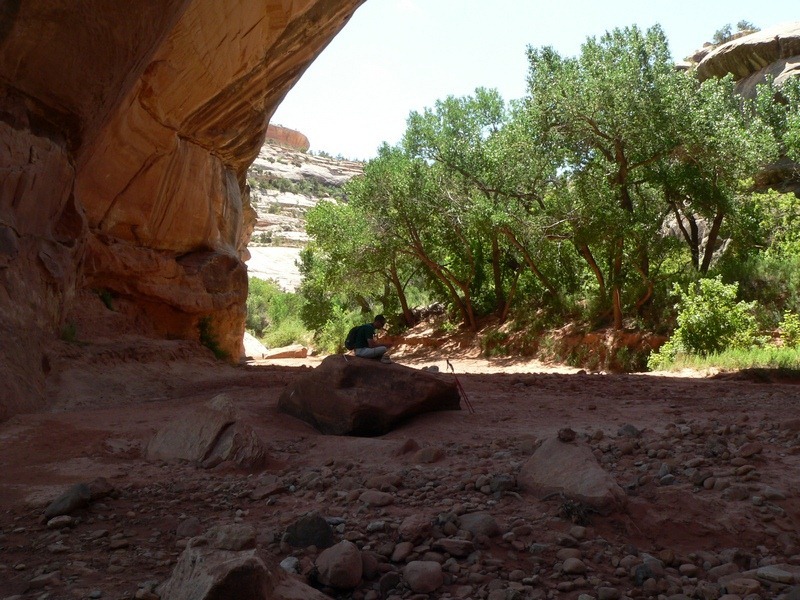 We never came out of the canyon at Kachina Bridge so I don’t have a photo showing the whole bridge. We enjoyed lunch in the shade. As you walk along the wash after Kachina Bridge, you have to climb up along the canyon wall to get past this huge waterfall that they call a Kickout. 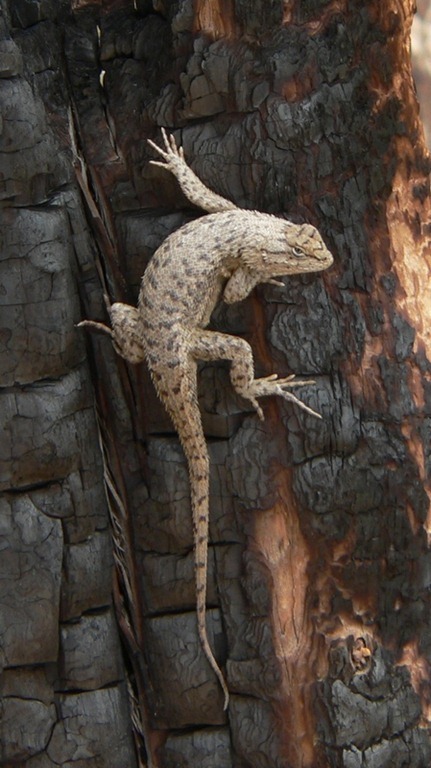 It reminded be of the Tinaja at Big Bend. You can just see Alan at the top in the photo. We are off to Capitol Reef National Park next. 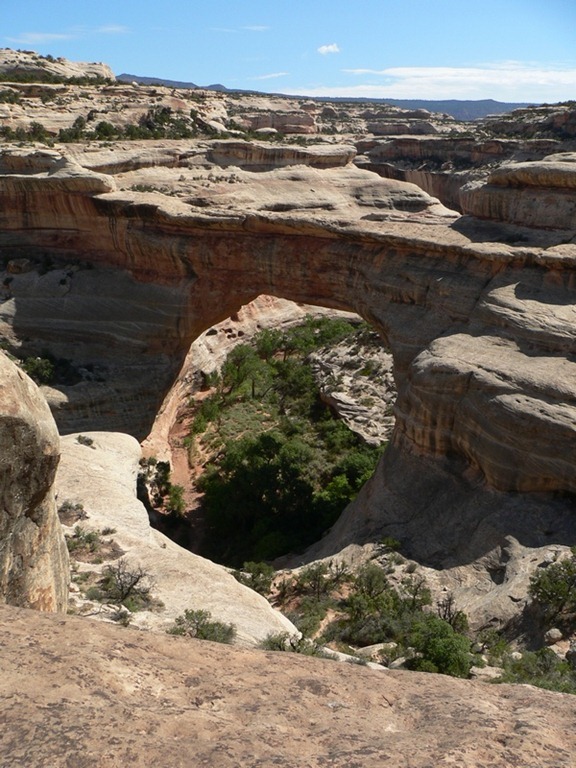 Natural Bridges are Arches but they are formed by water. This guy hung out with us while we had lunch on Prater Ridge Trail.